These moccasins came from the village of Nenana on the Tanana River, but the long, narrow shape of the beaded area reminded Judy Woods of the way her aunt Lizzie Starr, from the Kantishna River-Minchumina Lake area, used to make them. The Kantishna-Minchumina region northwest of Mount Denali spans territories occupied by both Koyukon and Tanana Athabascan groups. Judy Woods had seen the “old-time” bead pattern―somewhat resembling fish scales―but without the central floral design. 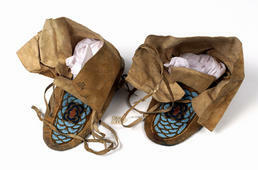 The upper parts of the moccasins are made of caribou, and the soles of moose hide. They have high tops with wrap-around strings and pointed toes. With some exceptions, Alaskan Athabascan peoples originally wore “moccasin trousers”—a one-piece garment that covered both feet and legs. (1) Separate moccasins that were not attached to leggings became common in Alaska during the late 19th century after the arrival of Hudson’s Bay Company fur traders, who brought the style from Athabascan and Chipewyan Indians of Canada. (2) Today, most moccasin makers favor a round-toed “slipper” style that Trimble Gilbert called ch’idin kwaiitryąh, after skin sewer and beader Liza Ch’idin of Fort Yukon.